There are so many books that have been written on this subject, you could spend your whole life reading about it, stopping you from achieving it. In this article, I going to list the lessons I’ve learnt from reading various books and talking from personal experience. I hope you find them helpful. his is the most important factor in achieving success which is to identify what you want. Most people will focus on very short term goals like, paying the bills or going on holiday etc, which is why they find themselves only being able to pay their bills and go on the odd holiday. This limitation of what you can achieve comes from yourself. The first thing to establish is what do you want to achieve long term, it could be to start your own successful business, become CEO in your current organisation or anything else. Once you have identified your goal, you need to believe that it is achievable. If you don’t personally believe that it is achievable or that you are not worthy of achieving it, then you will never achieve it. You must believe and have faith in your ability to achieve it. The way to start building some is to start taking the smallest of actions. Taking action and having faith goes hand in hand. More actions you take, the more convinced you will be that you can achieve it thus increasing you faith. 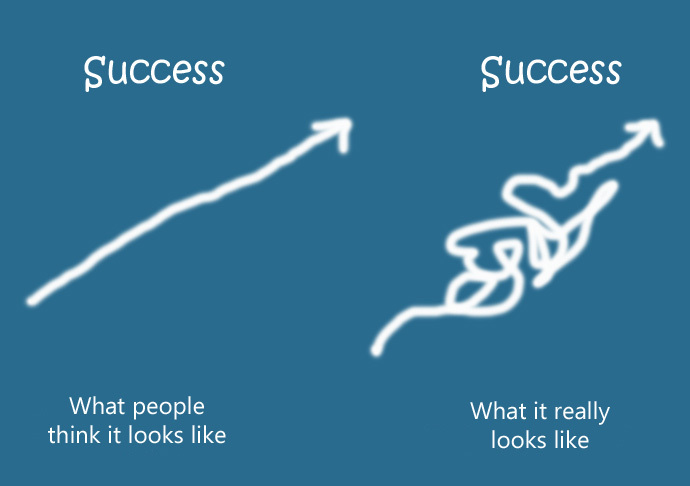 Taking action can be the roller-coaster ride of ups and downs, successes and failures but if you are focused and persevere, you will eventually be on the road to success. Success comes to those who are willing to work for it. I recently read a quote by Andrew Carnegie where he stated ‘a person is as wealthy as he wants to be’. On the surface it sounds stupid because we all want to be richer than we are so it can’t be true. But as he explains, how wealthy you want to be is determined by how much effort and time you choose to put in to it. How much time do you spend working on your goals? How often do you focus on developing your mind? Are you in the habit of going above and beyond what you are paid to do? Do you go out of your way to learn something new that you can utilise on your road to success? When was the last time you did something to promote your abilities? We live in a world where people want to get paid more for doing less. That is only good for people who want to live pay cheque by pay cheque. If you only do what you are paid to do then you will always work for wage. If you want to achieve success, you need to do more than you are paid for which will get you noticed and inevitably promoted or more opportunity to prove yourself will come your way and you will become indispensable, a linchpin of your organisation. Success is also determined by what you do outside of work. There is one commodity that we have the equal amount of which is, we all have 24 hours a day at our diposal. How you choose to use those 24 hours will determine how successful you are. A person generally works 8 hours and sleeps 8 hours which leaves you another 8 hours which are generally wasted not including eating and other essential activities. help you achieve any sort of success unless it is some way related to what you are trying to achieve like a documentary to increase your knowledge on a certain subject. Otherwise it is best to not waste time watching mindless TV or reading gossip magazines etc. Instead read a book on the subject of your goal or just something to broaden you thinking. If you are unwilling to dedicate some of your free time to work on your success then it will be impossible for you to achieve any more than what you are paid to do.